Welcome to the first-ever issue of The Bucket Sporting Supplement. These F U L L C O L O U R commemorative and collectable publications will document all of the world’s major sporting events as they unfold during 2011. 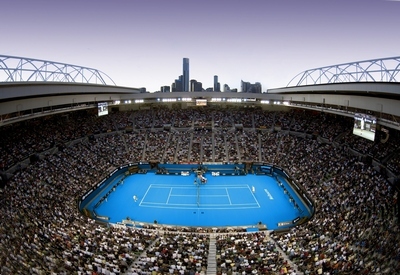 First on the calendar is the Australian Open Tennis Championships now under way in Melbourne. Our Chief Sports Reporter and tennis tragic since 1948, Edward “Pommie” Grannit-Deuce, has been embedded courtside for the last twelve days filing hourly reports and photographs, interviewing players and spectators, and digging deep into his photographic memory to provide all the essential statistics as well as keeping us informed of any unfolding behind-the scenes drama in the locker-rooms. 1. All references to the obscene financial rewards handed out to these young people who are, after all, just playing a game. 2. The histrionics and abominable sportsmanship including racquet-hurling or axe-chopping and mouthed obscenities. 3. Blatant attention-seeking/opponent-distracting behaviour such as extravagant grunting, yelling, squeaking, screaming and howling before, during and after striking every ball. 4. Banal interviews. 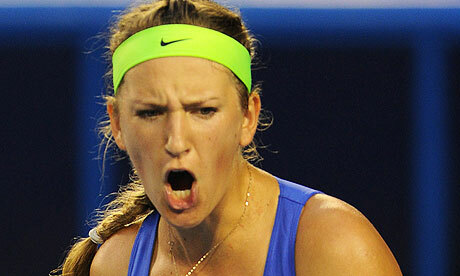 Tennis players and spectators are generally not renowned for being gifted orators or gushing fountains of wisdom. Please enjoy the following highlights package which includes every piece of action that was worth watching. After that I will proudly announce the winners. 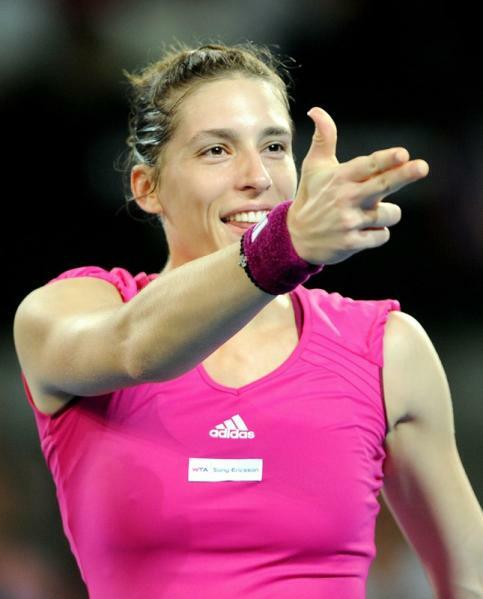 Andrea Petkovic, the extremely personable, intelligent, multi-lingual, pistol-packing and dancing German athlete who breathed some much needed fresh air into this stuffy event. 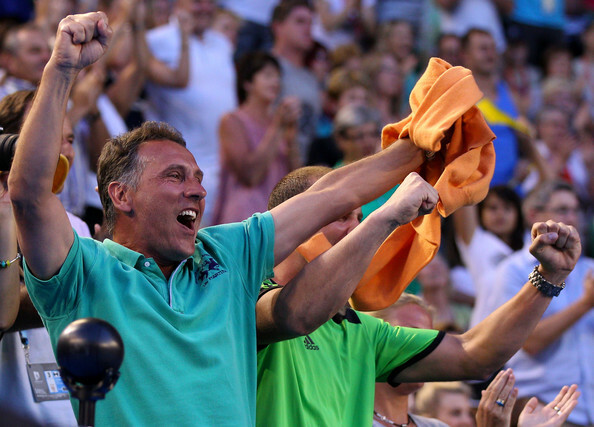 Zoran Petkovic, Andrea’s Dad and coach, who co-starred from the sidelines with his daughter in a memorable and whimsical post-match interview. The Bucket accordingly commends both of them for bringing back some of the “game” into professional tennis. Posted in Uncategorized and tagged sport, sporting supplement, tennis. Bookmark the permalink. Well goodness me Daniela……how did you ever find your way into The Bucket? I think you can probably stay. Broadly speaking you fall within my parameters of acceptable content. We may have a small problem with my unreasonable daughter Globet who has unilaterally decreed that no woman younger than herself should share space with me. You only fail that test by 10 months, so we'll just tell her that you are really 39 and all the exercise makes you look younger. No problem. Welcome to GOF's beautiful world, Daniela. Posted in Uncategorized and tagged daniela, globet, tennis. Bookmark the permalink. I have, for the past few weeks been in negotiation with the creator of The Bucket, concerning its future. 1. He is a deeply troubled soul, with such an array of personality disorders that he probably should be committed forthwith to an Institution for the Terminally Bewildered. 3. All of my future literary contributions to The Bucket shall be limited to serious subject matter only, in deference to the troubled state of the world. It is not an appropriate time for levity, trivia, or the inconsequential. Whats with all the grunting, girls? GOF has always enjoyed watching elite sportsmen and women on television. The four Grand Slam tennis events of the world are on my viewing list. Well they were. I am now discouraged. Poor GOF. Womens tennis used to be a favorite of mine, partly because I enjoy watching beautiful women in short skirts (for which I may, in 2020, seek counselling), but mostly because they play extended rallies where they are able to exhibit a broader range of skills than the men who just blast off a series of aces at 200+ kilometres per hour. So why has it become necessary in the last 10 years for some women players, especially from the ex Soviet bloc countries, to accompany every single stroke with ear shattering squeals, sneezes, grunts or facsimiles of orgasmic satisfaction? Champions of eras past, Hingis, Graf, Navratilova, King, Court, and Goolagong conducted themselves with efficient and dignified silence. Women golfers, soccer players, baseball and basketball players don't do it. Why has it seemingly becoming a prerequisite for highly ranked female tennis players? Any possibility it has something to do with bad sportsman(women)ship and distracting the opposing player? No, of course not. Silly me. There's probably a perfectly plausible sporting biometric explanation. One which has no concern for the principle that to honorably play the game is more important than to dishonorably win it. And thank you to whoever invented the television "mute" button. Posted in Uncategorized and tagged sportsmanship, television, tennis. Bookmark the permalink.